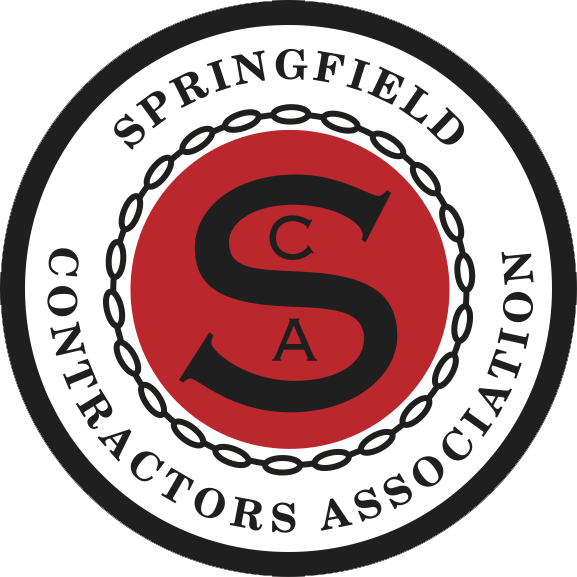 On March 16, 1953, a group of 22 men representing the General Contractors of the area got together to form the Associated Contractors of Springfield, which would later be changed to Springfield Contractors Association. The primary purpose of the organization was to enable contractors as an organized group to negotiate with local crafts on wage scales and benefits. Ray Aton was elected President and Chester Carson was VP. The dues were $1 per year which included $.96 for postage, and $.60 for notebook and paper. In July of the same year, the group changed their membership by voting to allow all firms in the building industry to become members. On December 24, 1963, the Springfield Contractors Association filed papers to be incorporated within the State of Missouri. The SCA has always remained independent of any other local, state or national affiliation, which makes us a very unique organization. In April of 1956, the group formed two committees: 1) to handle complaints from various member regarding Architects changing their specification based upon their opinions and 2) to see if some kind of licensing could be required in Springfield in order to keep unreliable contractors out of town. In February of 1968, the SCA requested a special meeting with the school district to discuss the listing of Subcontractors when bidding projects. SCA wanted to change the requirement from 24 hours after bid opening to 5 days. In January of 1976, Dr. McKenzie expressed the hope for closer co-operation between SMSU and the SCA. In 1984, Art Bushman was appointed to pursue the matter of slow plan review by the City and get the permit process improved. In June of 1968. The board voted to begin funding scholarships and assisting various civic organizations. The SCA awarded their first scholarship to Bobby Fleener in September of 1980. In 2013, David Atkisson and a committee embarked on the creation of an endowed scholarship fund. An account was opened with Community Foundation of the Ozarks in 2005. The idea of providing an employment service had been discussed for years but finally became a reality with the hiring of Debbie Young in June of 1988. In the fall of 1975, the Board began discussions and formed a committee to explore the hiring of an executive director. In October of 1984, Jim Hedges reported the membership voted to hire a permanent executive secretary starting in January of 1985. In November of 1985, the Board voted to hire Ada Lee as secretary starting in 1986. Leroy Yarbrough introduced Sheryl Letterman one year later as the new “permanent” executive secretary. In June of 1988, the Association moved into their first office. It was rumored that we wouldn’t sign a lease but gave them our word we would stick around for at least six months (we didn’t leave for 11 years). In 1995, the SCA purchased a small corner lot at Bergman and Nias for a new office. We broke ground on the new building on August 12, 1998 with Tom Wirt heading the construction project, and we officially dedicated the new building on October 21, 1999. In August of 1983, the Construction Industry Council reported to the Board that they had confronted many area Architects and Engineers regarding how many of them had stretched uniform practices, causing unnecessary expenses to Contractors in bidding and performing work. The list included: poor plans, last minute addendums, unreasonable completion schedules, poor specifications, time of bid openings, rebidding of projects and the practice of negotiating with several bidders after the bid opening. In September of 2001, the AIA Liaison Committee reported the need to look into problems that are occurring in the area with the closing out of jobs. In 2002, the SCA in collaboration with the AIA introduced the Bidding Guidelines for Owners, Developers, Architects, and Contractors. The SCA Bid Calendar was introduced in 2003 to assist Architects and Owners in scheduling upcoming bids.